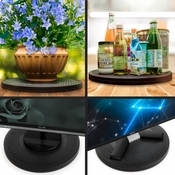 Home > Home & Outdoor > TV Stands & Wall Mounts > Aleratec Dual Sided TV Swivel Stand, 360 Lazy Susan Featuring Heavy Duty 250 lb Capacity, 15.5"
STRONG AND DURABLE: Easy rotation for the perfect viewing angle. Supports LED/LCD Flat screen TVs, speakers and household items. Rubber feet protect your furniture surfaces from scratches. HEAVY-DUTY ROTATOR: World renowned SGS, an independent third party, lab tested to support 250 lbs / 90kg weight capacity. 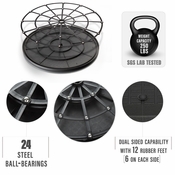 SMOOTH ROTATIONAL STAND: Perfectly balanced with no leaning or tilting, includes 24 high grade steel ball bearings that provide effortless rotation with just a simple touch of a few fingers. INDOOR OR OUTDOOR: Designed for both indoor or outdoor use, this lazy susan base provides a steady 360 degree rotation for an adjustable viewing angle. ANTI-SKID STURDY ROTATOR: Dual sided capability with 12 non-skid feet (6 on each side). Its high grade 24 ball bearings provide smooth rotation with just a simple nudge. The Aleratec 360-degree dual sided rotating swivel stand is constructed of high quality durable material with 24 steel ball bearings. Lab tested up to 250lbs, this rotator base is designed to securely hold large and extra-large TVs, computer monitors, flat screen LED/LCD TVs, computer monitors, planters’ pots, arts and crafts projects, Spray Booths or other household items that you want to display. 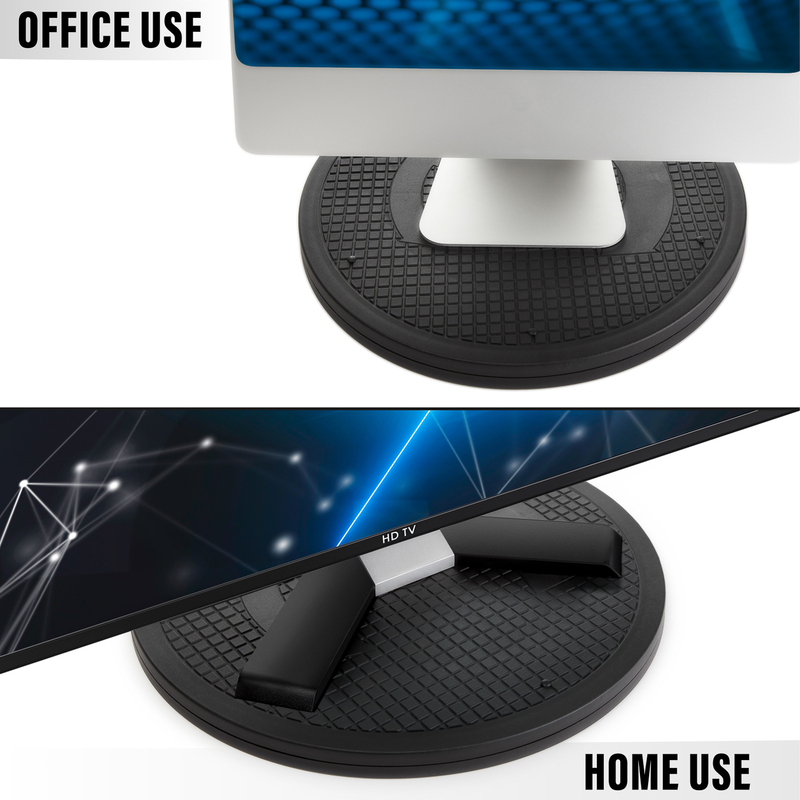 Swiveling is practically effortless and can be used for computer monitors to show someone across from you what's on your screen. 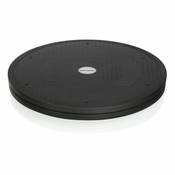 Leading the industry with 24 high-grade steel ball bearings built inside the turntable base, this stand provides no-noise rotation with just a simple touch. 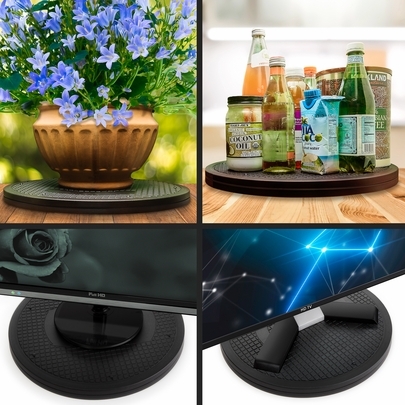 Now you can turn your TV or monitor to the sofa side while watching or streaming or turn it to the dining table side while eating, working, or crafting. The sturdy base provides a perfect viewing angle making it a practical addition to home entertainment centers or office and even craft rooms to use while you're watching your favorite how-to videos. 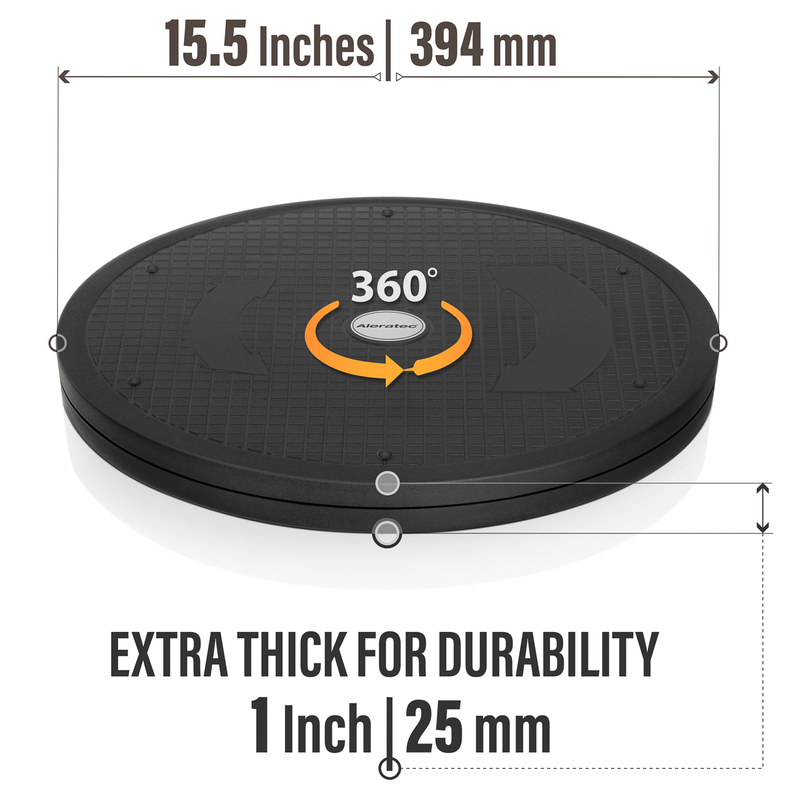 Multipurpose by design, this heavy-duty 15.5inch swivel is engineered for both rugged outdoor environments and quiet indoor settings. Construction is based on high-quality polypropylene, known for its resistance to both hot and cold temperatures and easy portability due to light weight. We incorporated this high-tenacity thermoplastic material for its versatility in engineering applications, robust chemical resistance, low moisture absorption, and easier recyclability to protect our environment. 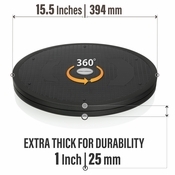 The heavy-duty spinning mechanism works like a Lazy Susan base and turns 360 degrees, features non-skid, non-scratch rubber feet built-in on both sides allowing you to use either surface as needed. Whether indoor or outdoor, simply place the swivel on top of your deck, credenza, desk, or counter top and you're ready to go.